Hi there! 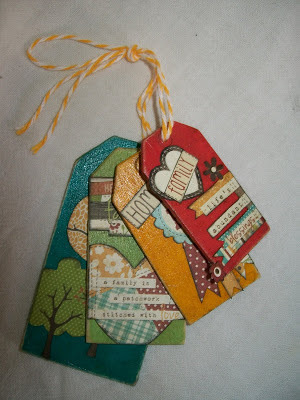 Shannon here again this week with another great fall tag, created with products from eclectic Paperie! This week I made the larger tag (Ranger Kraft Tags #8) and I created a little pocket on that tag to be able to hold the wooden tag set I also made. I did put a heavier bookboard tag behind the large tag so that it could hold the weight of the wooden tag set. These wooden tags from Maya Road were a lot of fun to play with. I have not used them before and I highly recommend them. 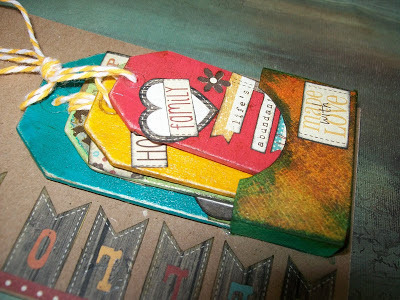 I painted the tags using the Claudine Hellmuth Studio Mini Acrylic Paints. The paints come in three sets of Urban, Contemporary and Metropolitan. I, of course, had to get all three! The size on these paints are great, they don't take up too much room, and the colors are so vibrant. Once the paint on the tags were dry, I went over each of them with the Claudine Hellmuth Mini Gloss Medium. 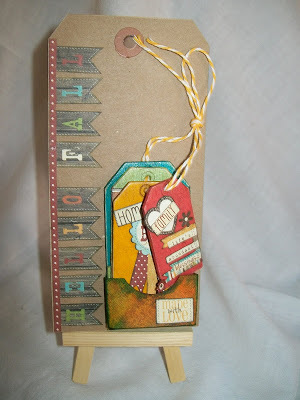 I decorated the large tag and all of the smaller wooden tags using the 6x6 Simple Stories Harvest Lane pad. As you can see there were lots of little quotes and goodies to cut out of those papers for me to embellish these tags with. In the past I've always bought the 12x12 Simple Stories pads, but I now really like the 6x6 size. The little paper goodies you can cut from this size pad (and for which they are known)is a great size when doing smaller projects. They'd be great for ATCs as well. I tied the wooden tags together using The Twinery twine in Lemon Drop. The little pocket for the wooden tags was just something I made really quick with some cardstock and I gave it some color using Distress Inks in: Broken China, Peeled Paint, Scattered Straw and Spiced Marmalade. My sister is hosting Thanksgiving this year and I've made her a little gift to bring over, I'm going to tie these wooden tags to the top of the boxed gift, I thought they'd be a perfect little embellishment for the gift. That's about it, I hope you like it! Next week is my last week to make a project for eclectic Paperie and I'll give you a hint...it just might be a Halloween themed project. If you get a chance check out the products and great prices at eP! Oh wow, what a GREAT idea! LOVE it.